Mini owners tend to face common problems with their vehicles. No matter the make or model of your vehicle, chances are there is a similar problem that exists in almost all makes and models. The reason for this is simple. No car can be perfect and each manufacturer learns from those common issues in previous makes and models. For Mini owners, one of the most common problems to experience is something related to a coolant leak. Some of the older models will experience problems specifically with the thermostat housing. Is your Mini having a Thermostat Housing Leak? You may have noticed that there was blue liquid leaking from underneath your car. This is a pretty telltale sign that you have a problem with your coolant. It could also be a sign that your thermostat housing has a leak. 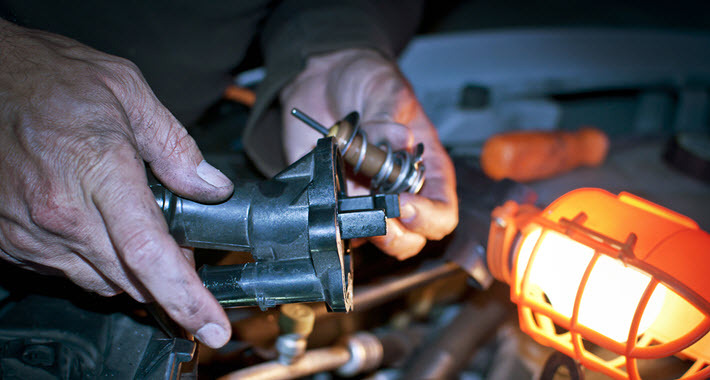 There are many reasons why the thermostat housing, the unit that holds the components that regulate the temperature in your car including the coolant and regulate the coolant flow into the engine, could be cracked or broken and therefore causing a leak. While you might be able to clearly see the blue liquid and know that there is a problem, you might not be able to diagnose it as well on your own. Repairs for issues involving coolant and the thermostat housing are not as complex as the repairs will be if you ignore the issue and let it compound. Cars with less than 36,000 miles on them can have repairs done on the products that are causing a problem while still under warranty. This is good for anyone who owns a Mini because the cost to fix the thermostat housing leak and subsequent problems with the water pump can range between $800 and $1,200 for the parts and the labor necessary. Obviously if other components have to be replaced, like the coolant, the hoses, or belt, that cost might go up. Again, the sooner you get this issue diagnosed and rectified, the lower your cost is going to be overall. Remember that the coolant plays a very important role in cooling your car. As the engine works and the temperature fluctuates, your thermostat will help relay information to the rest of the vehicle about how much coolant to distribute so that the engine remains at a proper temperature. If your coolant isn’t working or there is a leak in the thermostat housing then you might be transmitting those signals to cool the engine but there is no coolant to be found. Getting this fixed before the engine overheats is absolutely in the best interest of you, your car, and your wallet. If the source of the coolant leak is not immediately obvious, you will have to bring your car in to a professional auto shop where the problem can be properly diagnosed. There are two common methods that can be used to diagnose the issue with your vehicle. The first method is called the pressure test, where they test the pressure on the coolant system itself. The second is a bit more extensive and includes adding a special dye and then checking with a black light for the source of the leak. This second test will require about an hour to perform, so it will likely cost more for the labor charge. With the second method you might also face a charge for the special dye that is used. However, if you think that you have a problem with the thermostat housing and a leak inside the housing itself, this would be one of the fastest ways to diagnose the issue. If you are a Mini Cooper owner and you have a problem with your coolant leaking, it is not something you want to ignore. It is absolutely something that you need to get diagnosed and rectified immediately. It is not recommended that any owner continue to drive around with a coolant leak. If the thermostat housing has a leak in it and your coolant is improperly functioning, your engine could overheat, at which point the damage and subsequent cost to replace the engine would be significantly higher than getting the issue diagnosed sooner rather than later. You want to make sure that a qualified auto mechanic runs the diagnostics and makes the repairs as necessary. For more information on your Mini and any thermostat housing leaks, talk with one of our knowledgeable experts at Dell’s Service Center. We serve the Green Bay, Manitowoc, and Sturgeon Bay, WI areas.